Rev up and feel nature's breeze at higher speeds. The Allegheny National Forest is home to over 100 miles of ATV trails, located in both the northern and southern portions of the ANF. The largest interconnected trail is in the southern ANF, located between Marienville and Kane, where motorized recreation enthusiasts travel great distances to enjoy a 76 mile trail system and easy access to traveler amenities like fuel, food and lodging nearby. The largest motorized trail loop in the PA Wilds and the ANF! With oversight from the ANF Marienville Ranger District, the Penoke, Marienville and Timberline Trails are a 76 mile interconnecting trail system. The trail season typically runs from the Friday before Memorial day to the last Sunday in September. Hazardous weather conditions may cause the trails to close on short notice. If in doubt whether the trails are open, please call the ANF Marienville Ranger District ahead. The closest connecting towns for traveler services are Marienville and Kane, both located off of Route 66. With oversight from the ANF Bradford Ranger District, the northern half of the Allegheny National Forest includes the 20+ mile Rocky Gap ATV/Mountain Bike Trail just south of Warren, and the 10.8 mile Willow Creek ATV/Mountain Bike Trail located west of Bradford. The Marienville ATV Trail is approximately 14 miles of old roads and railroad grades traversing scenic and forested hills of the Allegheny National Forest. This trail is one-way travel except where marked. There are several steep hill climbs. 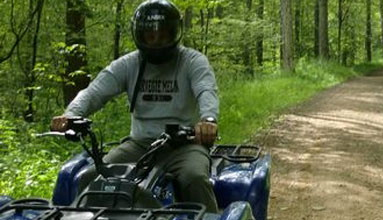 The Timberline trail was designed for ATV and motorcycle riders at the beginner skill level, and connects into the Marienville ATV/OHM Trail. The Timberline Trail is a system of 39 miles of interconnected trails, railroad grades and roads crossing through the scenic forested hills of the Allegheny National Forest. The timberline trail is best suited to ATVs. Riding surfaces are generally level and wide (averaging eight feet in width). The entire trail is a two-way system. In winter, this dual use trail provides snowmobile access from the south and southeast to the Allegheny Snowmobile Loop system. This trail is not groomed in winter. Best suited to off-highway motorcycles, this 23.1 mile loop is rated most difficult. The motorcycle trail offers a winding and twisting course on a rocky surface through the forest. Off-highway motorcycle riders can finish the trail in a few hours. ATV riders will find a very challenging ride that will take 4 – 6 hours to complete. This trail is not recommended for inexperienced or novice riders. The trail is one-way travel except where otherwise posted. Running for just over 20 miles, the Rocky Gap trail is divided into two loops by State Road 3005/Pleasant Drive. Due to steep side slopes, the ATV rider may experience more difficulty in certain sections. The 10.8 mile section of the southern loop is rated more difficult, and the 11.1 northern loop is rated most difficult. Both trails are one-way travel except where otherwise posted. During the winter season this dual-use trail provides snowmobile access from the northwest to the Allegheny Snowmobile Loop system. The Willow Creek ATV Trail is approximately 10 miles of old roads traversing scenic and forested hills in the Allegheny National Forest. The trail is rated More Difficult. The trail is one-way travel except where posted otherwise. Share your PA Wilds Trail Story! Help us share the true PA Wilds Experience on the trails. Submit photos, tips, stories or anything you think might be helpful or fun for other trail riders!